What chores can a 5-year-old be in charge of? What about an 8-year-old? When can kids start to learn to do their own laundry? Use this list of age-appropriate chores as a guideline when creating chore charts for your children. Keep in mind that all children are different and age is not the only factor when determining the right chore. In addition to age, think about maturity level, physical ability, and interest when selecting the right chores for your kids. Note that for the older age groups, you can select chores from the younger aged categories to build an appropriate list. Set your child up for success and choose an appropriate and doable amount of chores and timeline in which to complete them. Toddlers love to help with chores and while their help may not always be as helpful as we would hope, keeping their excitement and the habit of helping alive is worth the extra effort. Lots of toddlers love to see a visual reminder of their success, so making sticker charts is a great choice. Although chores may only be completed with your help each step of the way, you are creating positive habits for children to find chores and helping others a way of life. Put laundry in the hamper or to the laundry room. Dust with socks on their hands. Mop in areas with help. The great thing about preschool aged kids is that they are still fairly motivated to help. Preschoolers also love individual time with adults. If you take some time to teach them new chores one on one, they usually love it. Many kids at this age are ready to do chores without constant supervision. They also love rewards. Try using a sticker chart that allows them to build up to bigger rewards. For some preschoolers, tying chores to an allowance is a great choice. This can also foster independence by allowing them to choose a reward. Clear and set the table. Help out in cooking and preparing food. Carrying and putting away groceries. Although enthusiasm for chores may diminish for school-aged kids, they have other redeeming qualities that work well for chores. Most school-aged children have an overwhelming desire to be independent. Parents and caregivers can guide children to become self-sufficient in their chores by using chore charts to keep track of their responsibilities. Note completed tasks as this will help motivate children to continue working. Kids at this age will appreciate a set schedule and expectations. Throw a lot of unexpected work at them and watch them get upset. If you can create a schedule or system with a little input from them, you'll have a smooth transition. It's best to find a system that works for your family. Try not to change it without the input and support of the people it directly affects. Part of this system should address rewards and negative consequences so that these results are laid out and understood in advance. Learn to wash dishes or load the dishwasher. Most teenagers are capable of handling nearly any chore in the home as long as they've been taught properly. One thing to be sensitive to is the cramped schedule of teenagers. Just as we get overwhelmed when we have too much to do, teenagers can find themselves struggling to maintain an unmanageable workload. Monitor your teen's schedule and school commitments; adjust activities and chores accordingly. Replace light bulbs and vacuum cleaner bags. Do their own (or the family's) laundry. Clean out​ the refrigerator and other kitchen appliances. Keep in mind that children mature at their own pace and not all kids will be capable of advanced chores at the same age. 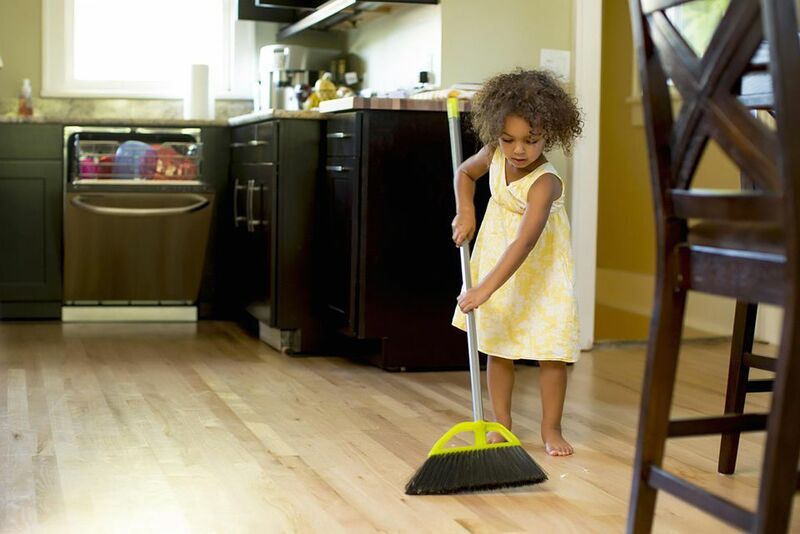 Likewise, some children may be ready for more difficult chores at a younger age. You are in the best position to supervise and evaluate your child’s needs and abilities. You can advance children through more challenging chores as they master the basic ones. It can be easy to let kids continue to perform the same chores because they're good at them, but introducing new chores at regular intervals will actually benefit them in the long wrong. Institute a "training period" with new chores while teaching them the ins and outs of new tasks.